No senator fought longer and harder for the rights of people of color, people with disabilities, women and the LGBT community. Daniel Inouye, who as the son of Japanese immigrants petitioned his government for the right to serve in World War II and then earned the Congressional Medal of Honor for that service in the fight against fascism, became the highest-ranking Asian-American political figure in the United States. 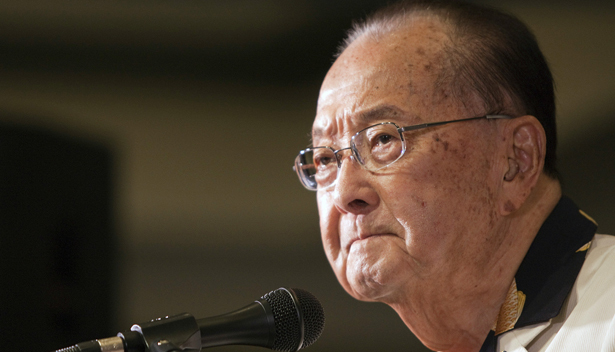 Indeed, at the time of his death Monday at the age of 88, Inouye was third in line to the presidency. The American Civil Liberties Union got it right when the group hailed Inouye as “a champion of civil rights and civil liberties” who recognized that his own political successes required him to champion the rights of others. He did so when it mattered most. Inouye was the last sitting senator to have participated in the great debates over Southern segregation. And unlike other senior senators who have died in recent years after long tenures, he was on the right side of those debates. The last sitting senator who joined the epic struggles to pass the Civil Rights Act and the Voting Rights Act, he led the fight for the Americans with Disabilities Act and was a key sponsor of the constitutional amendment to extend voting rights to 18-to-20-year-olds. That was classic Dan Inouye. He never hesitated to use his own experience, as a genuine “greatest generation” American hero, as tool for championing the rights of all Americans. Inouye’s advocacy across a career that brought him to Washington in 1959—as one of Hawaii’s first congressional representatives—was perhaps best illustrated in a remarkable 1968 keynote address to the most tumultuous Democratic Nation Convention in the party’s history. Addressing a deeply divided convention just four years after he joined fellow senators in breaking the filibusters and advancing landmark civil rights legislation, Inouye stood before a convention where many delegates had been on the other side of the fight. He did so as a World War II hero, a Bronze Star and Purple Heart (and later Medal of Honor) winner whose arm was amputated in a field hospital on the edge of an Italian battleground. And he quietly demanded that the delegates recognize the sacrifices of all Americans. The Democratic convention of 1968 is usually remembered for the wrangling over the Vietnam War—which Inouye, who had been an ally of Lyndon Johnson’s administration, decried as “immoral” in his remarks. But Inouye, the first person of color ever to deliver a keynote address, devoted his remarkable speech to a deep discussion of lingering racism in the land, and by extension in a party that would that fall see many “solid South” states back the renegade third-party presidential run of Alabama segregationist George Wallace. Less than a quarter century after Japanese-Americans were confined to internment camps, the young senator spoke of his Japanese ancestry. But he pointed out that racism takes many forms, explaining to the convention and the nation that, though he was a person of color, his circumstance was different from that of African-Americans in Southern states and inner cities. For African-Americans, in particular, the barriers had been cruder and more violent. Recalling his speech four decades after the fact, in an interview with the Honolulu Advertiser newspaper, Inouye expressed delight that a young man who had grown up in Hawaii would be nominated by his party as its presidential candidate at the Democratic National Convention. But Daniel Inouye was not satisfied. That was Daniel Inouye in 2008, speaking as he had in 1969, bluntly, truthfully, about the racial divisions that still haunt America and the struggle to make the Democratic Party and the nation recognize and confront the causes of those divisions. How can the Democratic Party carry on Daniel Inouye’s legacy of progressive politics? Find out here.